Mobile field station (NOMAD) combines social science and natural sciences to explore human-Rangifer interactions in the Kola Peninsula of the Russian Federation and the Murmansk Region of Samiland. 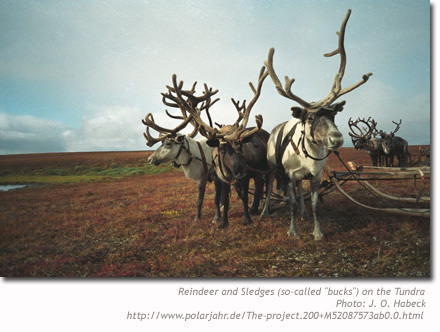 Research seeks a comprehensive understanding of the changing environment, climate change, and resource use of domestic reindeer herding. Researchers will follow the herds for up to a year (March 2007-Februrary 2008), and document socio-economic adaptation to environmental processes and changing seasonal rhythms: “state of the herd and grazing range; response and resilience of reindeer-dependent communities, etc. — corresponding coping strategies, and changing modes of resource management” (1). Central to NOMAD is the development of ethnographic research methods to document migratory human and animal interactions (state-farm cooperatives and activities, market forces, mechanisms of management and control, interaction with tourism, and impact of changing climate) and to overcome shortcomings of fixed field studies that focus on local specifics. NOMAD is a featured project of the International Polar Year, and provides educational outreach to media, teachers and researchers through its website and blog.